Christmas is in exactly 2 weeks so if you need some gift inspiration, here it is. I've put together a good little edit of 10 items, all under £10. Perfect as stocking fillers, secret santa presents or if you're on a budget. 1. Soap & Glory Get a Smooth On - 2 of my favourite S&G products in miniature form. Perfect for someone who loves pampering products or someone who travels a lot. 2. I love this Holiday Spirit Mug from Anthropology, especially the delicate gold handle. They do a great selection of pretty mugs as well as candles and other bits and bobs under a tenner. 3. Lipsmackers - Coca Cola 3D Can About 2 years worth of lip balm in fun, novelty packaging. What's not to like? 4. 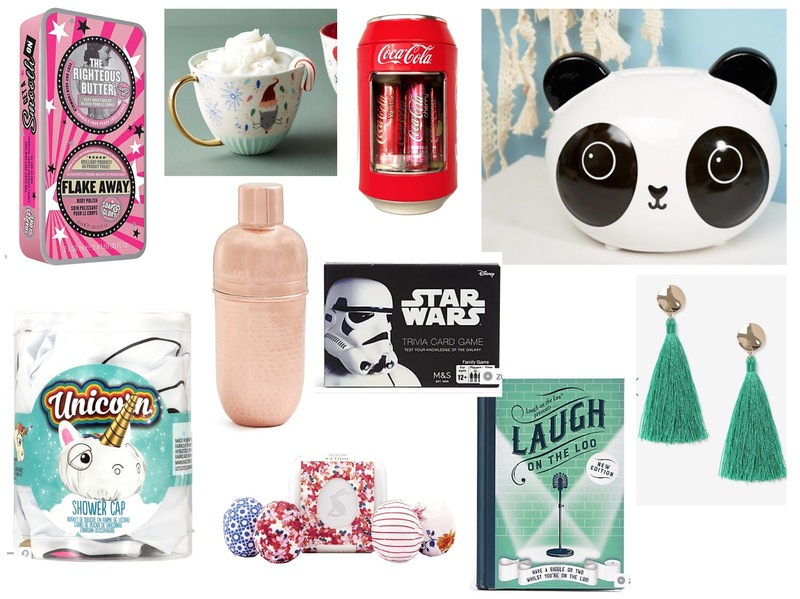 Sass & Belle Panda Money Box, for anyone who loves pandas (basically everyone) and is trying to save some pennies. 5. NPW Unicorn Shower Cap, anything to brighten up dark, cold winter morning showers. 6. Marks & Spencers Mini Cocktail Shaker, to brighten up dark, cold winter evenings! 7. The Joules Bath Fizzers come in such pretty packaging and are a lovely indulgent treat. 8. Star Wars Trivia Card Game, because EVERYONE knows a Star Wars fan! 9. Marks & Spencers Laugh on the Loo Book, this one needs no explanation! 10. Topshot Stud Tassel Drop Earrings, on trend, available in lots of colours and look a bit like christmas trees. Win.